What was it exactly that moved me so emotionally at this ceremony? Earlier this month I attended a high school graduation. It wasn’t my son’s graduation. Thankfully, we have 13 more years to prepare for that event. This was a commencement at Girard College. 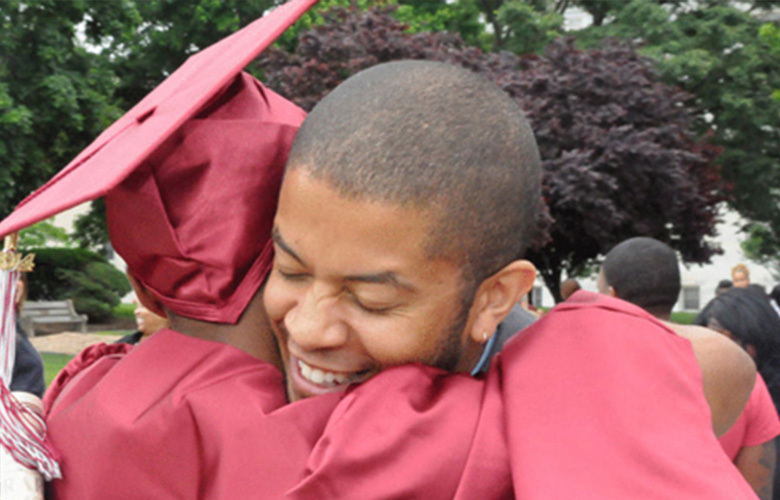 A celebration of 39 high school students who beat the odds. If you’re unfamiliar with Girard College, it’s a tuition-free boarding school established in 1848 to serve orphans and at-risk children from 1st grade on through high school. Most of the students are from areas of Philadelphia where it’s assumed that they won’t go to college. They’re from neighborhoods where less than 60% of the kids graduate high school and only a small fraction of those continue their education. 98% of the Girard students sitting in front of me that day are not only graduating, they’re going on to college. These amazing students beat the odds and are going to attend some of the best institutions in the country including University of Pennsylvania, Wesleyan and Howard. Maybe that’s why I thought this was so special. I thought back to the day I graduated, some 20 plus years ago. I can imagine the emotions my parents experienced. They felt proud. They probably thought back on how quickly the years went by and maybe felt a twinge of sadness that I was about to continue my education away from home (or perhaps I’m fooling myself and they were happy that I’d be out of the house and my brother and I would no longer be fighting). But clearly it was an expectation that I would graduate. In my suburban neighborhood in North Jersey most kids graduated and went on to college. It was just that…expected. Maybe I was moved by the Girard parents. I met parents who hadn’t graduated high school. They were crying and cheering for their children who had achieved so much more. Children who had broken the cycle in their families and given future generations a new standard to aspire to. Maybe I was moved by the student speakers who talked about how Girard was both their home and a family. How they loved Girard. Maybe I was moved by a lasting bond that students have with their high school. A bond evidenced by the man sitting next to me, a seventy-something Columbia Professor and Girard graduate who belted out the school song proudly along with the other students. He travelled from NYC to attend graduation. He is forever connected to Girard because of the impact this school had on his life. Or maybe I was moved by the commencement speaker, Marc Morial. He spoke passionately about the wonderful accomplishments of the students in front of us. And most importantly he talked about the world that they would inherit. He talked about the negativity that seems so pervasive with the media. He questioned why a shooting in the neighborhood was more likely to be covered in the news than the annual success of this fine institution. Of course, I checked the news outlets the next day, and there was no coverage of this event. Instead I was informed of a husband’s prostitution arrest, an armed robbery and a car crash. Why have we become so consumed with the negative? Why shouldn’t journalists seek out what makes us amazing and regularly make inspiring news a top story? When did 39 students beating the odds become less newsworthy than a car crash or arrest? Regardless, Girard’s graduation is news to me. That is why it’s my lead story. And, since you’re reading this, it’s news to you too. Congratulations Girard College class of 2014! Special thanks to my friend John Avondolio. This article benefited enormously from his input. If like me, you want a dose of the positive, you can find it at Good News Network, a site dedicated to reporting good news. If you want to create your own good news, here’s a list of 75 ways you can be an everyday hero through unique and interesting acts of kindness.